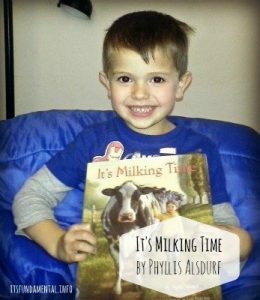 “Every morning, every night, it’s milking time.” It’s Milking Time by Phyllis Alsdurf tells the story of a little girl who lives on a dairy farm. Every morning and every evening, she helps her father milk the cows and care for the calves. Accompanied by beautiful illustrations from Steve Johnson and Lou Fancher, this book gives both children and adults insight into life on a farm. 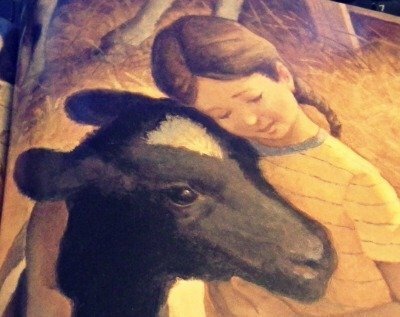 I read this book with my oldest (age 4), who loves all things farming. We live in the city, but he loves visiting my mom in southern Indiana and helping her take care of her horses. I think we both learned a lot from this book. It walked us through the entire milking process, how the calves are cared for, and all the things that milk from the farm can be made into. What I really appreciated is that Phyllis Alsdurf tells the story in such a way that you don’t feel like you are learning; you’re reading a great story that just happens to be educating you about farm life. One of the driving points of the story is that this farm work must continue every day, every morning and every night, no matter what. Farming is a job that doesn’t come with days off. 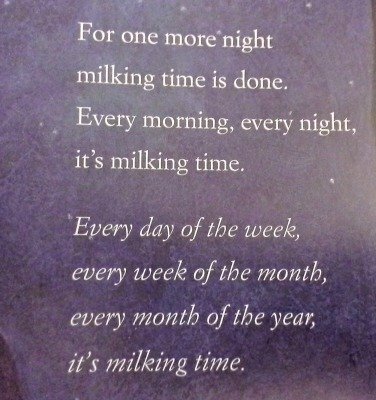 The refrain, “every morning, every night, it’s milking time,” reminds the reader of this throughout the story. I don’t know if this book would have held the attention of my almost-three-year-old, but it was a great read for my four-year-old and me. We both learned so much, and we really enjoyed the beautiful illustrations. If you want an authentic look at life on a dairy farm, written in a way that kids can embrace, you have to add It’s Milking Time to your collection. This is a great choice for teachers or homeschoolers doing a unit on farming, or just for those who want to know more about life on a dairy farm. Fundamental Children’s Books is a participant in the Amazon Services LLC Associates Program, an affiliate advertising program designed to provide a means for sites to earn advertising fees by advertising and linking to Amazon.com.